A possum at my front door! Hubby was up and gone early on Saturday morning while the rest of the family slept on to a more respectable hour. I was up a while before I spotted the bag by the front door. I thought it might be a forgotten birthday present for my daughter and peeped in to have a look, I got a bit of a fright when I saw something dark and furry inside! The kids slowly drew themselves away from the TV and glanced around the door. “Oh yea, that’s Daddy’s possum” they said in that nonchalant (just a possum Mum) kind of way! …I guess the children have lived with their Dad’s wacky ways all their lives and don’t find it too startling any more, but, I have to admit, after 13 years together he still manages to shock the hell out of me on a regular basis! It was a big pelt, grant it, but not exactly large enough for a household rug! When himself eventually arrive how I asked him about the possum and what exactly I was supposed to do with it. Turns out he was right! Possums are arboreal (tree-living) creatures native to Australia, New Guinea and Sulawesi. These are about 70 different species of these marsupial but it was the common brushtail possum (Trichosurus vulpecula) that was introduced into New Zealand by European settlers in the 1837 in a wish to establish a fur trade. 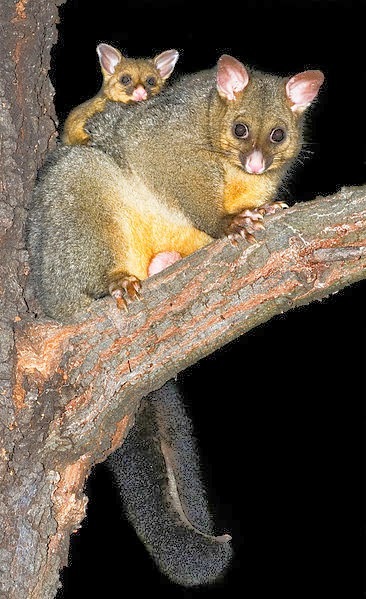 In its native habitat the brushtail possum is a semi-arborial species, the second largest possum species in Australia and well adapted to both rural and urban dwelling. Despite its fondness for eucalyptus leaves it will also forage on seeds, fruit and flowers and has been know to include meat in its diet, eating insects and some small birds and mammals. This adaptive and non restrictive diet allows it to spread its feeding reach to domestic vegetable gardens and dust bins. This possum has natural predators in Australia (primarily the Dingo) which keeps the population at a safe level. In fact hunting of the animal is now illegal in Australia, in order to protect the species. In New Zealand the story is quite different. As with the introduction of many non-native species there is a problem with a lack of natural predators. The population numbers soared and the possum is considered a major threat to agricultural and conservationist lands. It also is a carrier of the highly contagious bovine tuberculosis disease and culling is therefore required in order to keep the population numbers in check. The bushtail possum found in New Zealand come from two main sources, a smaller grey species from Australia and a larger, blacker species from Tasmania. Both types are larger in size in New Zealand that their relatives “back home” due to a plentiful supply of nutritious food and no natural predation. Current estimates suggest that there are 30 to 40 million possums in New Zealand (compared with a human population of 4.5 million). The New Zealand possum population can eat through 21,000 tonnes (approx 180,000,000 kilos) of leaves, fruit and berries in one night! So that is the story behind my possum pelt, it was actually given to my husband from a friend who has recently returned from New Zealand, where he worked on one of the possum culling programs. So we have learnt a little about the possum in New Zealand thanks to this gift but I still have no ideas of what to do with it. Have you any suggestions? If so please do let me know in the comments below! 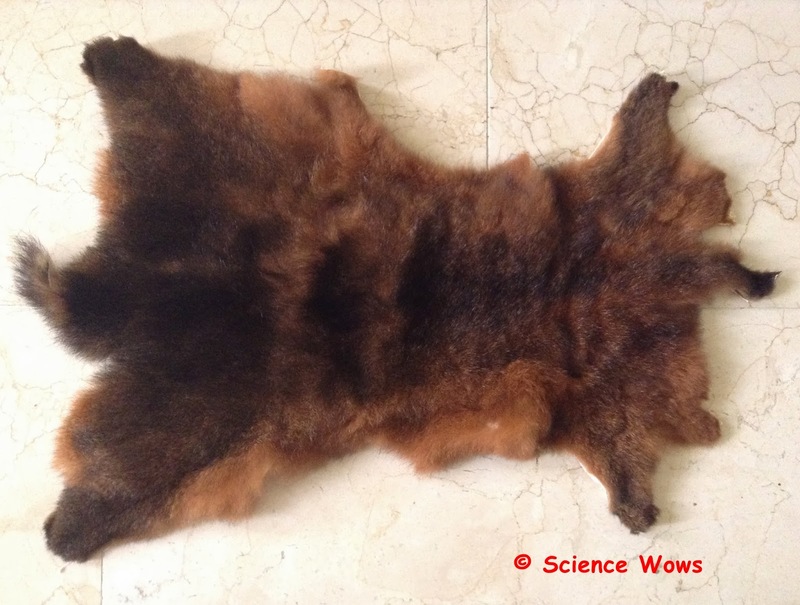 Our new possum pelt… any suggestions what we can make with it? Any sports-people or people needing therapy for a bad back in your life? Sadhbh that is a brilliant link! I didn’t know that possums had hollow hairs (knew about the polar bears); In fact himself does suffer with back problems so this might be a realistic solution… Thanks! That is fascinating and the population ratios of possum to person in NZ is shocking! I say print out this post and frame it and the pelt. Yes, good plan! Or, if all else fails, leave it outside someone else’s front door 😉 ! Thanks for your comments Lilly and yes, I have researched this topic a little bit further after talking to someone about the extent of the culling and what is actually involved. I fully intend to amend the post (just haven’t gotten around to it yet as I have been changing the website). Thank you for pointing out about the reference I used, to be honest I checked out a number of references and used the one with the most conservative numbers, plus I expected an official NZ government site to be an accurate reference and reflection of the Country and it’s stats. I appreciate you taking the time to comment and inform me on these points. As you suggest, I do indeed have the pelt over the arm of a sofa, it makes for a lot of interesting conversation when visitors call. it would make a nice hat for that wacky hubby of yours.